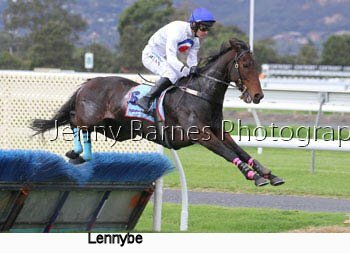 Today saw the return of jumps racing to Morphettville for the season and what a race it turned out to be. 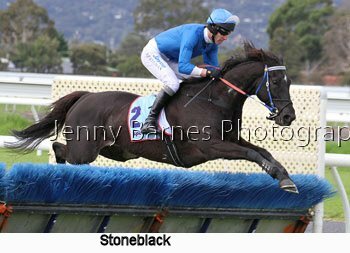 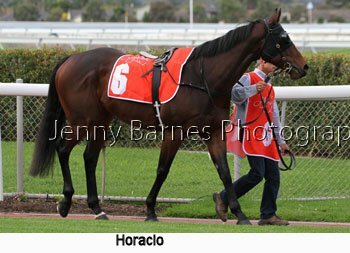 Victorians Stoneblack who had won three of his 6 jumps starts and King Triton (winner of 1 and placed at the other 3 of 4 jumps starts) were expected to battle the race out but it was a South Australian runner that proved too good. 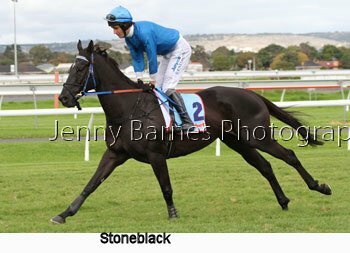 Stoneblack took the lead early and went at a very strong pace from the outset which saw the field string out early with Crocodile Tears up in second with Dumosa and Rabbuka next followed by Honour the Force then Lennybe and Backburn. 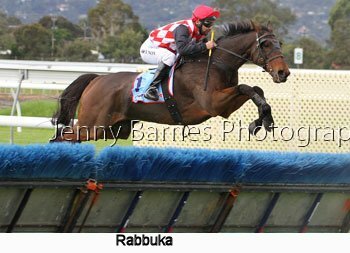 Over the jumps in the home straight Stoneblack was well in front of Crocodile Tears and Dumosa then a gap to Rabbuka followed by Honour the Force. 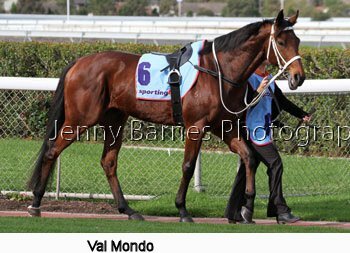 By the 1400m the field started to pack up as Crocodile Tears and Dumosa joined Stoneblack followed by Rabbuka with King Triton starting to make ground. 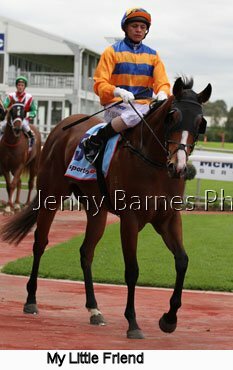 Over the jump at the 1000m Dumosa went up to challenge Stoneblack from Crocodile Tears as King Triton started to run on from Rabbuka. 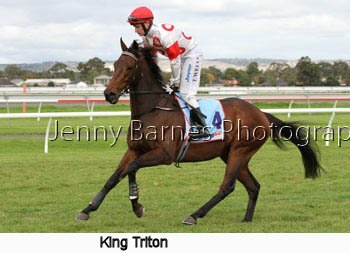 Around the home turn Dumosa dashed away in front with King Triton chasing hard as Honour the Force ran on from the tiring Stoneblack. 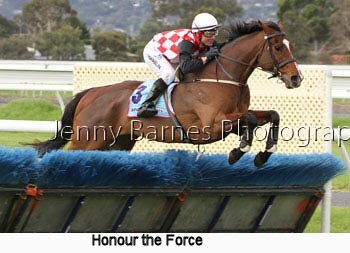 Over the last Dumosa was in front from the closing King Triton from Honour the Force as Lennybe started to run on late with a gap to the rest. 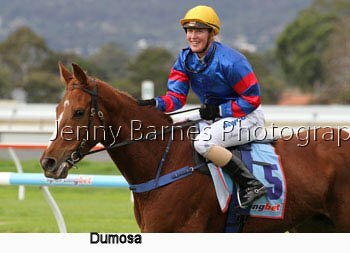 Dumosa had too much reserve in the run to the line to hold on to win from King Triton with a gap back to Honour the Force third and Lennybe fourth just ahead of Backburn who was having his first start in around 18 months. 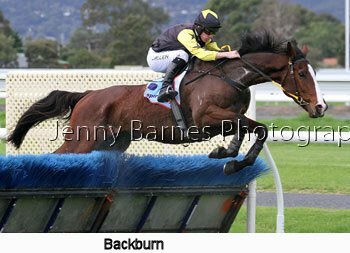 It was a race of firsts with Amy Hermann winning her first jumps race at her third jumps ride while it was also Dumosa's debut over the jumps after being a consistent flat performer in staying races for year while it was also the first race on the main track with the new plastic rail installed. 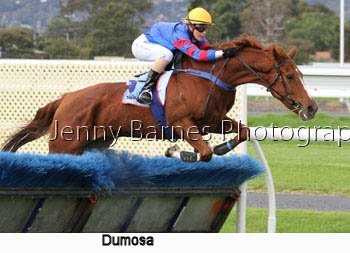 Dumosa is by Jeune out of a Nassipour mare so was born to stay and had previously won 4 of his 33 starts on the flat and had recently been placed in a jumps trial in Victoria and won a recent trial at Oakbank prior to the race. 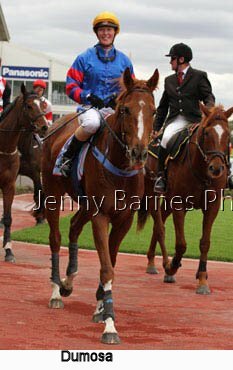 He is trained by Barry Brook at Oakbank who has also had recent success with Yesquire who has mixed flat racing success with jumps victories. 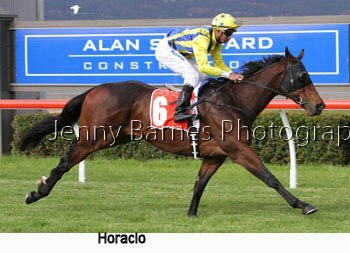 Race 2 was for the 2yos where My Little Friend from the Tony McEvoy stable ridden by V Colgan defeated Print Money with Stimulatte running third and denying Amy Herrman a successive win on the flat and on a different course at the same race meeting which would have been unique. 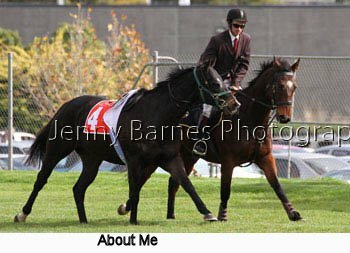 The start of race 3 was delayed with the scratching of topweight Grand Taj and About Me who got loose behind the barriers and galloped off to try to find the gap to head off the inner course and back to the mounting yard before being caught and returned by the clerk of the course. 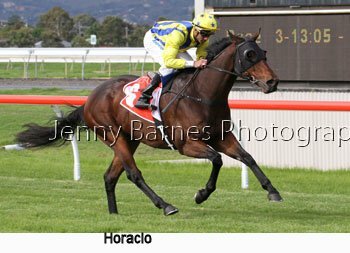 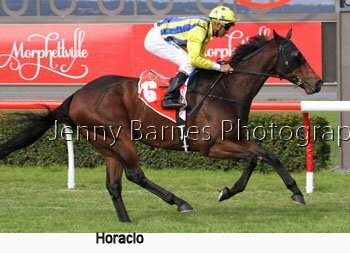 The race got underway and it was the Victorian trained Horacio ridden by D Tourneur who was too good racing away to win from Alchemy's Eight with Our Mimi third. 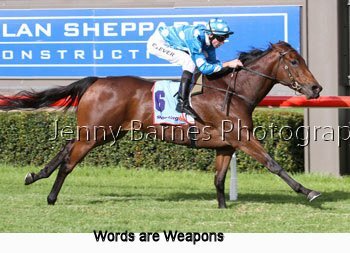 In the fourth race Words are Weapons made it two from two in defeating Impulse Buy with Tuffenup Princess third. 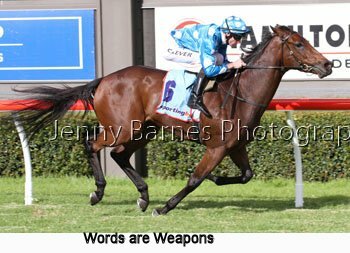 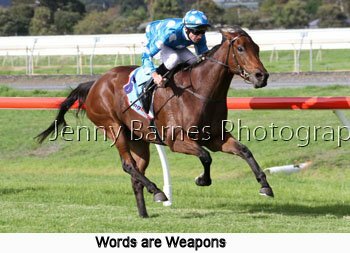 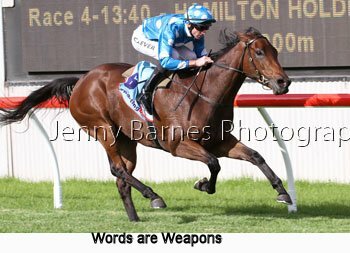 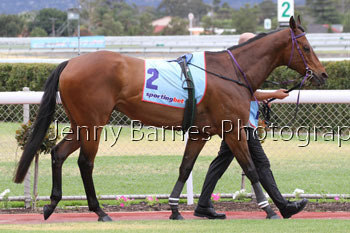 Words are Weapons by Dubawi from Tears for Tristram and is from the Sam Kavanagh stable and was ridden by Chad Lever. 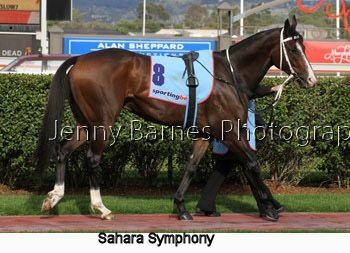 In race 5 Sahara Symphony bolted out of the mounting yard with jockey D Tourneur doing well to stay aboard as not only did he make it out of the walkway and gate but was able to steer the bolting horse away from the hurdle still on the course proper well past the gap to the inner track before finally pulling up. 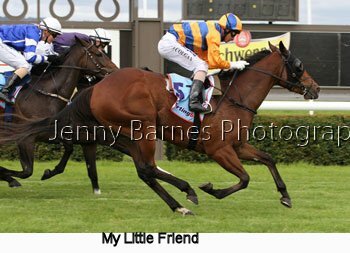 Passed fit to race Sahara Symphony led until the turning for home where Elldami took over from Distillation with Val Mondo about to run on. 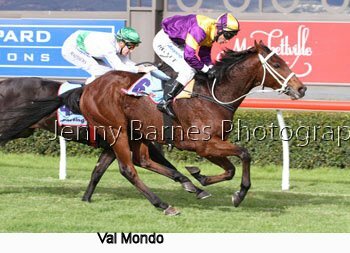 Inside the final 100m Val Mondo joined and headed Elldami who fought back but Val Mondo was too strong winning narrowly with Distillation holding third just ahead of Oui Si Attitude who was running on late. 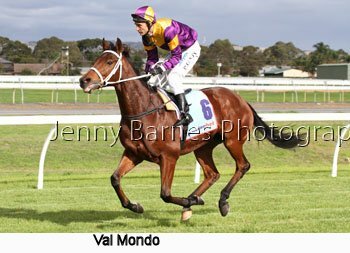 Val Mondo is a German import from the Victorian stable of A Purcell who has now won 3 races from 33 starts with 9 placings and was ridden by Paul Gatt. 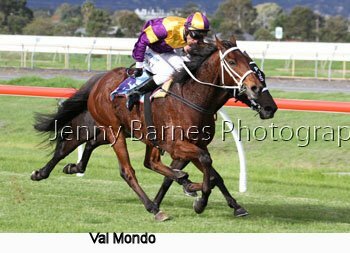 In the next Absalon was too strong after putting a gap on the others in the straight and held on to win from the fast finishing Road Warrior with River's Lane third bringing up a double for both Sam Kavanagh and D Tourneur while Out of Coober stormed home late to defeat Name The Day with Woakwine third. 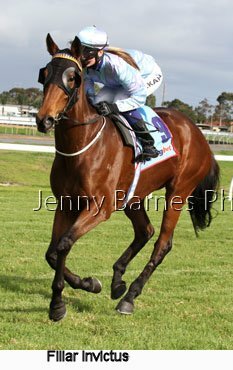 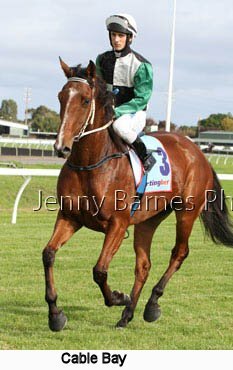 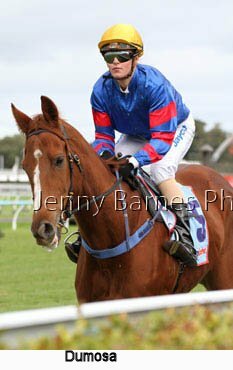 Out of Coober has now won 3 races from 16 starts with 5 placings and was ridden by B Claridge for B Smart of Morphettville. 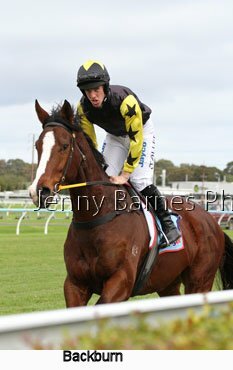 In the last race Koe from the Victorian stable of T & K O'Sullivan and ridden by Matthew Neilson easily defeated LIttle Miss Bourke with Rowdy Rocker third. 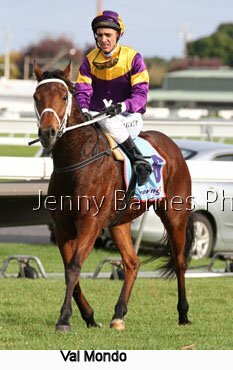 Sad news came through after the races that Bold Line had be put down due to not responding to treatment for a massive infection. 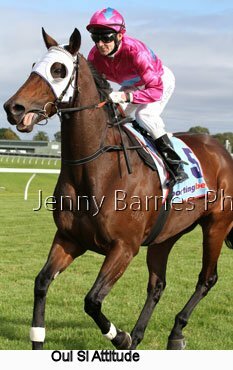 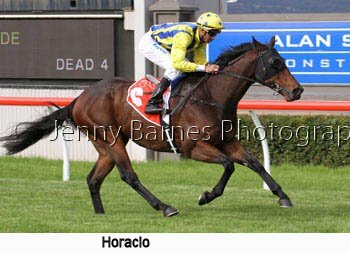 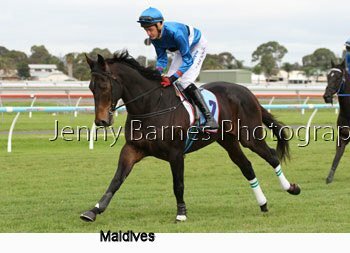 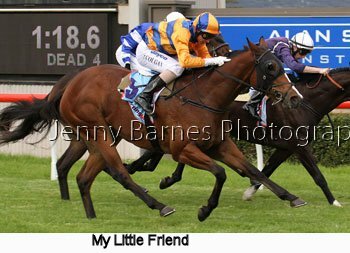 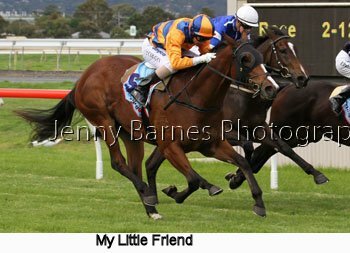 The 10yo has been a fantastic local performer starting in 107 races for 18 wins and 26 placings and his wins include the 2007 Manihi Classic with numerous other placings in stakes races. 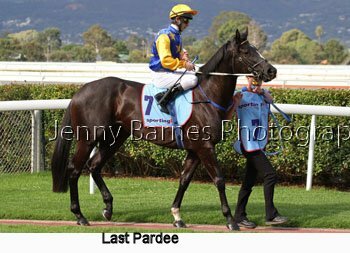 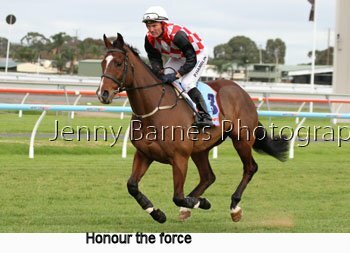 He won from Adelaide to Darwin at at many SA racecourses in between and last raced on the 18th of May where he struck interference in running while his last win came at his previous start at Penola in early May.